Last Wednesday I presented a video of Tillman, a surfing bulldog from Oxnard California. As soon as I posted, a friend (thanks, Stacey!) 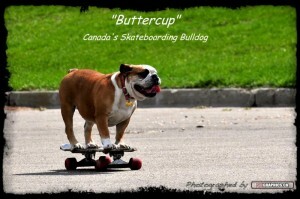 pointed me to a video of a Canadian skateboarding bulldog, Buttercup (yup, that’s her name). Best of all she is based in Edmonton, Alberta. Like Tillman, Buttercup can skateboard. However while Tillman surfs, Buttercup snowboards. Given the location and climate of Edmonton, it makes sense. We’re hundreds of miles away an ocean or anywhere else to surf (excluding the World Waterpark at the West Edmonton Mall, and I’m betting that dogs aren’t allowed in). Plus for at least four months of the year, our ground is covered with snow! One of the most common questions asked about Buttercup’s boarding abilities, is “how did you teach her to do that?” To which Buttercups’ human replies, “We didn’t, she taught herself. It’s something to do with the Bulldog breed, they love boards of all kinds. Even as a nine-week-old puppy, Buttercup was fascinated with skateboards.” At the age of 8 months, Buttercup got her first skateboard and “she took to it immediately and became obsessed with it. All she wanted to do was skateboard.” The only way get her to stop was to take her board away. Sounds like she had been taking the lyrics of The Beach Boys hit Fun, Fun, Fun to heart! Buttercup and her human are available to make public appearances, which they do on a regular basis. Buttercup will be at the Edmonton Pet Expo on January 19th and 20th, 2013, the Calgary Pet Expo on April 27th and 28th, 2013, and the Vancouver Island Pet Expo on May 25th and 26th, 2013. To learn more about Buttercup, or to book her for your event, visit her website. Now, let’s see Buttercup in action on her skateboard. Here’s Buttercup enjoying winter on a snowboard! This entry was posted in Videos, Wednesday Humour and tagged bulldog, Buttercup, dog, Edmonton, skateboarding, snowboarding, Tillman. Bookmark the permalink.